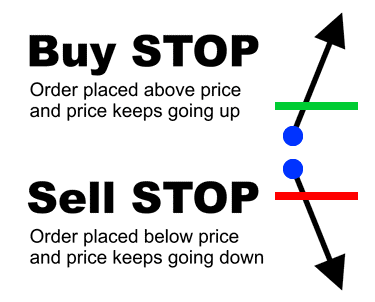 A market order is one where traders can buy or sell at the best available price. For instance, let’s say that the Bid price (sell-price) for EUR/USD is currently at 1.1140 and the Ask price (buy price) is at 1.1141. If a trader wants to go short the pair (that is to make a return on a decline in the EUR/USD price), then the position would be opened at the bid price of 1.1140. If the trader would like to buy the pair (the Euro in this case as it is the base currency), the trader would buy at the ask price of 1.1141. This is an order that is placed to either buy or sell at a certain price different from the prevailing market rate. 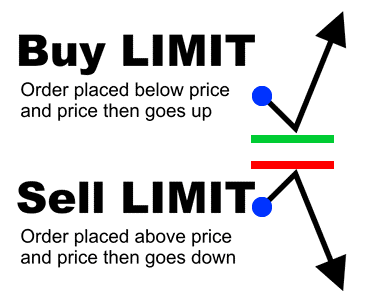 As an example, if the GBP/USD is trading at 1.50 and you would like to buy at 1.49, then you can use a buy limit order to place a Buy Limit Order. If you think the GBP/USD will reach 1.52 from the current market rate at 1.50, and then decline to 1.45, then you can place a Sell Limit Order to sell at 1.52. The benefit of these orders is that you don’t have to watch the price, your trading platform will automatically execute your trades at the best available rate according to your instructions. Either wait in front of your screen until the currency pair hits the 1.2080 level, or set a sell limit order at 1.2180 in your trading platform. When the price reaches 1.2180, the trading platform will automatically execute the pre-set limit sell order at the best available price. Traders take such positions when they believe that the price will reverse upon hitting a predetermined price level. A large group of traders are businesses and corporations that deal with imports and exports. This is a significant amount of transactions that are executed by small firms and large multi-national corporations alike. They all participate in the currency market, as is required by the structure of their businesses. Corporate traders are responsible for a significant portion of daily market flows on the forex market. Their trading activity is spread across the globe and traditionally managed by experienced market professionals. For example, let’s assume that the GBP/USD is currently trading at 1.2050 and is trending upwards, and you believe that the price will continue in this direction if it hits 1.2160. 2.set up a stop buy entry order at 1.2160. In contrast to a Limit Entry order, a Stop Entry order is used when traders feel that prices will continue moving in a single direction. This type of orders is used by traders that follow the price trend and are looking to buy or sell a breakout from a period of range trading. What is the Stop Loss Order? To prevent accumulating losses if the price continued to move away from the direction you predicted, you can use a stop loss order. A stop-loss is only active until the position gets closed or the trader cancels the stop loss order. For example, a trader who bought the EUR/USD at 1.2240 could place a stop-loss order at 1.2200 to limit his loss to 40 pips (1.2240-1.2200), provided that the stop-loss order is executed exactly at 1.2200. A trailing stop is a kind of stop-loss order that moves alongside the price. For instance, if a trader decides to short-sell the USD/JPY at 90.80, with a trailing stop of 20 pips. This means that originally the stop loss is at 91 and if the price moves downwards and reaches 90.60, the trailing stop would move down to 90.80. If the USD/JPY declines another 20 pips, the new stop will move to 90.60. The position will remain open as long as the price does not rise 20 pips. Once the market price hits the trader’s trailing stop price, a market order will be sent to close down the position at the best available price. A GTC order remains in place until the trader decides to cancel it; no broker will cancel the order until it is instructed to do so. A GFD order remains active until the close of the current trading day. Since the foreign exchange market is open 24 hours, usually the closing time is 17:00 EST or 22:00 GMT. This is the closing time for the US session and is the time when such orders are canceled. This order type is the combination between two entry orders and, or, two stop loss orders. When one order is triggered, the other order will be canceled. This sort of order setup is usually used when a currency pair is trading sideways, and the trader expects a breakout, so they place one order above the current price and another below the current price. Let us assume that EUR/USD is trading at 1.1550. Say, a trader wants to buy at 1.16 over a resistance level, on expectations for a breakout. He/she also thinks that if the price slips below the 1.15 level a breakout to the downside is due. Once the 1.16 level is reached, the trader’s stop buy order will be triggered and the sell order at 1.15 will be canceled. An OTO is just the opposite of an OCO, placing one or a multitude of sub-orders once the main order is triggered. A trader can set an OTO order when he wants to set profit-taking and stop-loss order ahead of time, even before getting into a new trade with an entry order. For instance, say, the USD/CHF pair is currently trading at 1.2050. A trader believes that once the pair reaches 1.2100, it will start reversing and head downwards only until it reaches 1.1900. To make trading easier and hassle-free, our trader can set a sell limit at 1.2100 and also place a related buy limit at 1.1900, and just in case, place a stop-loss at 1.2150. As an OTO, both the buy limit as well as the stop-loss and take profit orders will be placed only if his initial sell order at 1.2100 is triggered. It is important to remember that when using different order types and trading, in general, there are usually different amounts of liquidity behind each price level. Let's take as an example, the EURUSD pair which is trading at 1.2003. There might be five million U.S. dollars changing hands at that price, but at 1.2004 there might be just one million dollars. So if a trader would like to buy for six million at 1.2003, then it will be impossible to complete the whole transaction at 1.2003, and the trader might experience what we call slippage, as the rest of the order is filled at 1.2004. This means that your average buy price will be slightly higher than the 1.2003 you expected to get. Sometimes, when there is thin liquidity on the market, the price might even jump from one price and pocket of liquidity to another, this is called a price gap. Gaps are prone to happen when trading resumes after the weekend, as traders adjust their positions to reflect any news that reached them when the markets were closed. Gaps may also occur around major news events such as the U.S. NFPs, central bank interest rates meetings, etc. All of this means that we might not always get filled at the desired level in our entry order, because of the lack of liquidity or weekend or news gaps when using limit, entry, and stop loss orders throughout our trading. That said, Amana Capital is bound to be providing its clients with the best possbile execution rates.